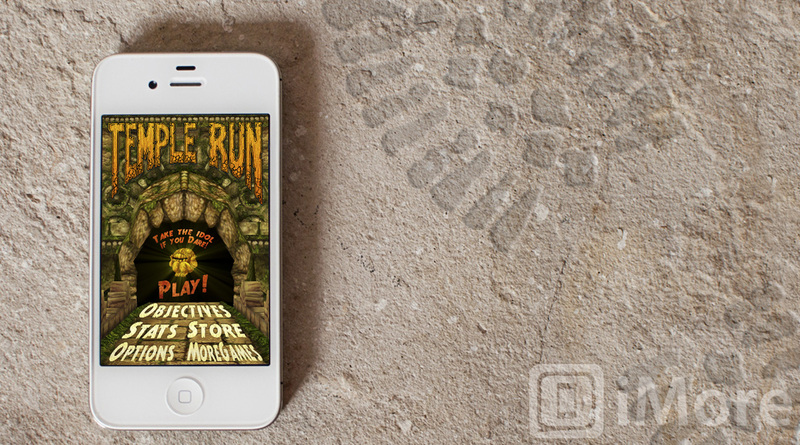 Temple Run is a fun, easy to play 3D “runner” game. You goal – to run…that’s all, run away. Think of it like this – you are Indiana Jones, you have just stolen the idol from the temple, and now, instead of being chased by natives, you are being chased by hairy monkey. That is the game in a nutshell. Using simple controls, you try to keep your character running as long as possible. You start off on the temple wall, but eventually can move to a stone wall, a swamp walk way, and back and forth between all three areas (I don’t know if anything else comes along, I haven’t made it that far yet). As you run, you have to dodge obstacles – trees roots, gaps in the wall, fire traps, large trees, etc. To dodge, you either can jump over something (by swiping up), slide under something (by swiping down), or run on the left or right side of the screen (by tilting the iPhone left or right). Simple, right? Eventually you may have to turn a corner, and you do this by swiping either left or right. It sounds simple, but it is surprisingly difficult. And surprisingly addictive. I have found myself saying “just one more time…I know I can get farther”. The route changes each time, so don’t rely on memorizing the pattern, you just have to take it as it comes. You can pick up coins along the way, and use those coins to buy various power up that will then later appear in future games – such as magnets to attract more coins, invulnerability so you don’t have to jump over chasms, and a free life in case you die. If you are really impatient, you can also purchase coins with an in-app purchase. But the heart of this game is... running. As enjoyable and addictive as the game is (and trust me, it is both), I still wanted more. I wished there was a two player mode – maybe racing against each other. It would be sort of funning to occasionally see someone else running in a different direction as you are doing the same! More scenes and locations would be fun as well. I don’t know if there is a final “winning” point in the game (do you make it to a get-away plane or something) but I would like to think I am trying to reach a goal rather than just blindly running. Despite the addictive nature, I wish it had more! All in all, Temple Run is a completely enjoyable, easy to learn and play, addictive game. I think anyone would have fun playing it – the key would be stopping rather than telling yourself “I can get farther next time!”. The game is free, so I strongly recommend giving it a try.